The Supreme People’s Court (Court) recently issued a report on civil litigation in the Chinese courts in 2014 with some big data and analysis. (The graphics in this blogpost are from the report.) What are the trends relating to commercial disputes and what do they mean? Trend #1–the number of civil and commercial cases has almost doubled in the past 10 years, despite obstacles to filing law suits, well documented elsewhere in blogposts and academic articles (and recognized as a major issue by the Court). Outcomes of implementing legislation regulating the economy and society. 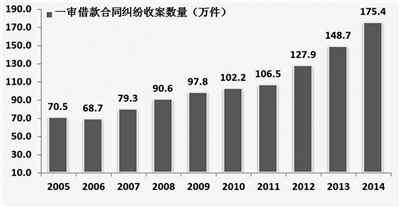 Over 9 million civil/commercial cases were accepted by the Chinese courts in 2014, up 7.41% compared to 2013. 1.2 million cases were carried over to 2015, reflecting a change in performance indicators for the courts, described in this earlier blogpost. 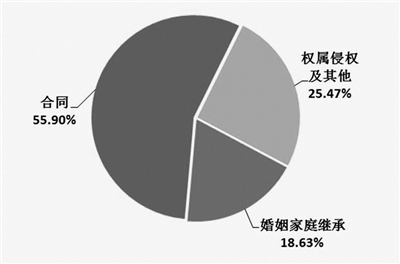 In recent years, civil and commercial cases have constituted 63% of all litigation in the Chinese courts. As the Court report noted, the enormous growth in the caseload places even more pressure on the judges. The large caseload, poor pay, lack of respect, and responsibilities unrelated to hearing cases have motivated a significant number of judges to leave (as this recent article highlights). The personnel changes announced in the judicial reforms have exacerbated these trends (and were anticipated by the drafters). real estate development & management cases. large amount of private lending [民间, generally known as shadow lending outside of China], leading to many more disputes. (I will publish an article on these disputes in the near future). In 2014, the courts accepted almost 700,000 sales contract disputes, an increase of 12.28%. According to Court research, many of these cases involved small companies (SMEs). Many of these cases involved small family companies, with inadequate contract templates, leading to disputes. New real estate construction cases accounted for 118,700 cases, an increase of 18.7%, while 173,000 real estate development cases were accepted by the courts, a increase of 5.53%。 The large increase in real estate construction cases is related to the tightening of funding for real estate development and the hot and cold in the real estate development market. New first instance ownership disputes accepted in 2014 reached 2 million cases, an increase of 3.67%. Tort cases accounted for 1.6 million of those cases. New shareholder disputes accounted for about 26,0000, an increase of almost 37%, with a smaller number of commercial paper disputes (48000), an increase of 15.46%. The Court commented that SMEs have been most affected by the overall macro-economic downturn, which has indirectly led to all sorts of shareholder disputes. The new Company Law has made it possible for funds to come in and out easily, but because many of these companies lack secure sources of operating capital and have to depend on private lending (shadow banking), if one party to these transactions has a funding problem, it causes a multi-party chain reaction and creates many complex shareholding disputes. 2) The Court has moved away from a simplistic policy of “mediation first” to a more nuanced approach to dispute resolution, as indicated by its initiative regarding diversified approaches to dispute resolution. Chinese civil litigation reflects what is going on in the real economy and society (this will be even more the case when the effects of case filing reforms are documented) and the effects of government policies and controls on both. Although the US and the European Union are negotiating bilateral investment treaties (BITs) with China, it appears from news reports that no one in either negotiating team has considered the impact of the current state and ongoing reforms of the Chinese judiciary on those BITs. These issues deserve more serious attention. Foreign investors (or more often, subsidiaries of foreign investors) in China are increasingly finding themselves in Chinese courts and this trend is likely to continue. This entry was posted in Commercial law and tagged civil litigation, shadow banking disputes.